My grandmother was known to many as Maude of the Desert. She was a North Dakota grown farm girl who after nursing school road the train west and seemed to fall vastly in love with the Colorado River and all her beautiful tributaries. I grew up to the tales of her travels in and around the Colorado. She rode the rapids the year Glen Canyon Dam almost failed, hiked the canyons until she couldn’t anymore, and enjoyed being immersed in the warmth and magic of it all. Our family seemed to be born with that silty river in our blood as a result of her love for it. A few years ago, shortly after she was diagnosed with cancer, I asked her out of all the places she has been in the world, which place haunted her heart the most. Without hesitation she said, “Stillwater Canyon”. I made arrangements immediately to head to that section of Earth so I could share a piece of that river with her while there was time. She ended up having surgery the day before I left, and for a woman who hiked the Grand Canyon well into her late seventies, it was hard to see her so frail. But she smiled as I walked into the hospital. The first thing she said to me was, “I don’t think your Uncle knows how to row a boat, you’ll have to show him”. She said it so firmly, like nothing else in this world mattered. She then proceeded to give me sound advice about sleeping along Stillwater Canyons walls and other words I will carry through life. I gave her a kiss and told her I would see her the following week. Eight days later…. 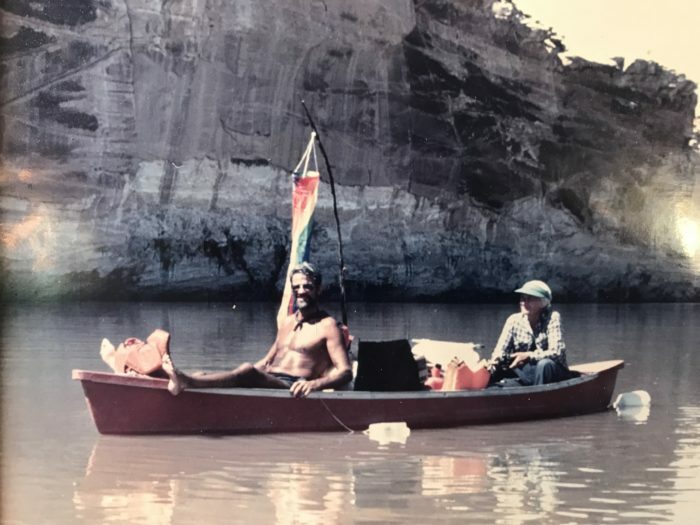 Five of which were canoeing down 52 miles of the Green river in Stillwater Canyon to the confluence, we emerged from the Colorado to learn that my grandmother had passed away. And the detail I wouldn’t find out till later was that while I was swimming in the warm Colorado water looking for the perfect piece of driftwood to bring back to her from her favorite place, she was taking her last breaths. I always wonder if she felt the calmness of the water in that moment. In the warm memory of the water.